Fires vs Your Home - AM/PM Insurance Agency, Inc.
California is no stranger to brush fires, but this year seems like everything is going up in flames. The drought has put some of our cities through the ringer, to say the least. To make matters worse, modern homes aren't built like they used to and burn FASTER than before. Homes are being built faster and more efficiently, but because of building materials, synthetic furnishings, larger open layouts, window constructions homes burn an estimated EIGHT TIMES faster than in past decades. A single room can be engulfed in flames in 5 minutes, whereas before it could take approximately 30 minutes. This gives homeowners and firefighters much less time to react to these safety hazards. Build with materials like concrete, steel, masonry, solid wood and other traditional building materials that have a lower burn rate. Man-made materials like board, composite wood and veneers ignite and burn at a faster rate. For a home's frame, it's suggested to use either concrete or solid wood with metal studs. For walls and siding, select a fire-rated material like stucco or fiber cement. Installing tempered glass or dual-pane glass are effective window options. 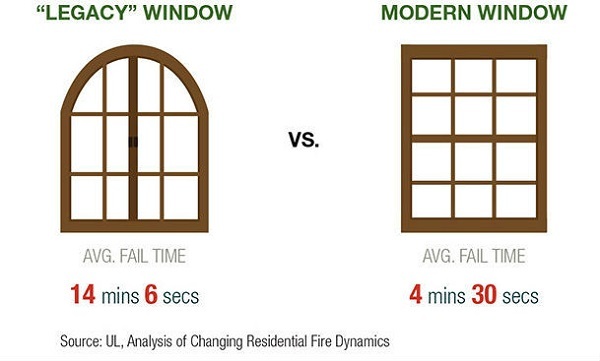 Window framing also makes a big difference: steel offers the best fire protection, wood or aluminum would be the next best thing. Vinyl is the least fire-retardant. Using flame-retardant fabrics for window treatments can also help prevent the spread of fires. These systems automatically turn on and alert a central station when triggered by a fire. The pipes of a dry sprinkler system don't contain water, which eliminates the risk of a bust pipe. These can be installed at any time, but the most cost effective time to install would be during the building process. There should be at least one smoke detector per 1,000 square feet and on each level of the home including hallways and stair landings. Heat sensors should be placed in the kitchen, laundry room, garage and mechanical areas. Both should be tested frequently, and batteries should be checked regularly to make sure they work. Space out your furniture to slow the spread of fire. Limiting the amount of furniture in a room will also be helpful. Keeping flammable items away from fireplaces, heaters, and cooking appliances. Always exercise being careful where lit candles are placed. These should be inspected every year. Having a fire extinguisher near by is also a great idea. Thank you to all the brave Firefighters and First-Responders who put themselves in danger to save those in need. 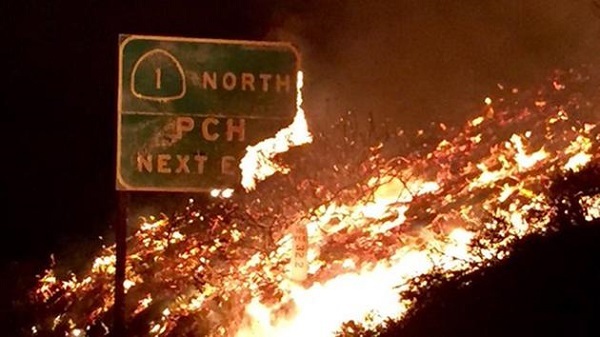 We truly appreciate you and wish safe returns home after long days and nights fighting all of the fires here in SoCal. All the information from this post comes from this article.